We took RoboSlam to the 2014 Dublin Maker event in Trinity College last Saturday, where we had a great time showing off some of our robots to the public and chatting to lots of other makers about the fascinating projects they were exhibiting. We’ll be blogging lots more about our experiences at Dublin Maker over the coming days, but for the time being I just wanted to post the graphics that we used on the T-shirts we got printed for the day so that we have them on file if we need them again. To edit the SVG file in the Linux version of Inkscape, I needed to copy the following font files into the “.fonts” directory in my home directory. Otherwise the lettering appeared incorrectly because I created the original SVG file in Windows, where these fonts were presumably installed. In fact, the front and back images I used for printing the T-shirts had solid black backgrounds, which was a mistake on my part. I should have made the backgrounds transparent so that the plain black sections of the rectangular image would have simply been left as the original black fabric, which actually makes the finished shirt look a lot better. I’ve modified the images files linked above (SVG and PNGs) to make the backgrounds transparent. 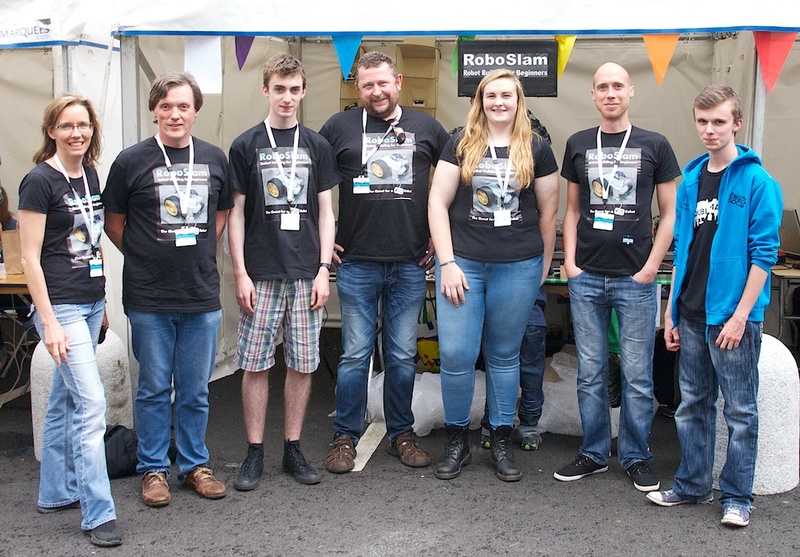 Here is the full RoboSlam team from Dublin Maker 2014. Left to right: Shannon Chance, Frank Duignan, Shane Ormonde, Damon Berry, Claragh Patton Kelly, Ted Burke, Paul Banahan.